Is Dow 16,000 possible. Sure. It's less than 8% away from the April all-time Dow high. But, the mere fact that Dow 16,000 is predicted by one of the most followed money polls, suggests that (best case scenario) getting there won't be easy. How do fish get caught? They open their mouth. 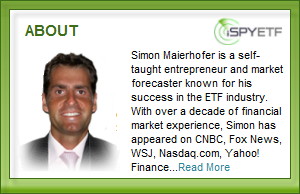 How do investors get hosed? They follow the crowd. This rather reliable rule of thumb (don’t follow the crowd) has been distorted by the Fed’s quantitative easing. Yes, prior to QE, investor sentiment used to be a rather reliable contrarian indicator. Nowadays some sentiment indicators have to be taken with a grain of salt and subjected to additional scrutiny as the Fed has taken the edge off extreme readings and their contrarian implications. Personally, I like to take a look at the composite sentiment picture made up of sentiment polls, money flows and my own personal headline assessment. Barron’s publishes a magazine to make money and to make money you need to write about stuff people like to read. Bullish news does the trick right now. This suggests that a great many of investors are back into stocks, now hoping for higher prices and looking for ‘evidence’ confirming their bias. That’s not good news for the bulls. 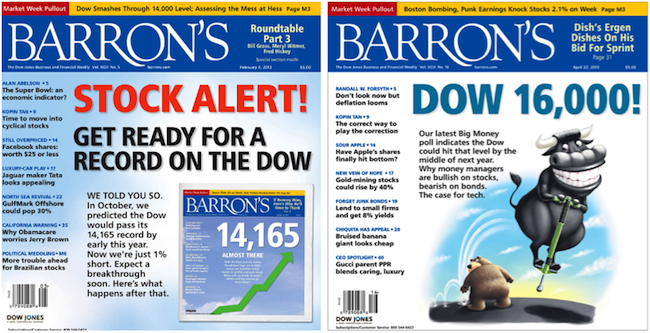 In all fairness, it has to be said that Barron’s has gotten their forecasts right a few times recently. But Barron’s had its ‘prime contrarian indicator moments,’ such as: “Is $5000/ounce the new target in gold’s run?” in August 2011 or its ueber bullish 2007 big money poll. In my admittedly unscientific estimation of headline sentiment, the media is still not as enthusiastic as it was in late 2010 or prior to the 2000 or 2007 highs. Barron’s Big Money Poll results are nevertheless concerning and combined with weak seasonality, waning market breadth will probably lead to lower prices. Dow 16,000 later on in 2013 doesn’t seem so far fetched though. Don’t get me wrong, now is not the time to be short (we went short at S&P 1,590), but I wouldn’t write off Dow 16,000 unless key support is broken.